Lenox offers timeless designs that have been a treasured part of American holidays for generations. Unmatched quality and hand craftsmanship result in exquisite pieces that bring a special glow to your home. No other gift expresses the joy of the season more than specially-chosen Lenox collectibles for the people who you cherish most. Best of all, these products are created by Lenox, the name more closely associated with holiday entertaining than any other. The confidence that Lenox has in the unmatched durability of every item they offer is backed up by a lifetime breakage replacement policy to guarantee many years of enjoyment to each customer. 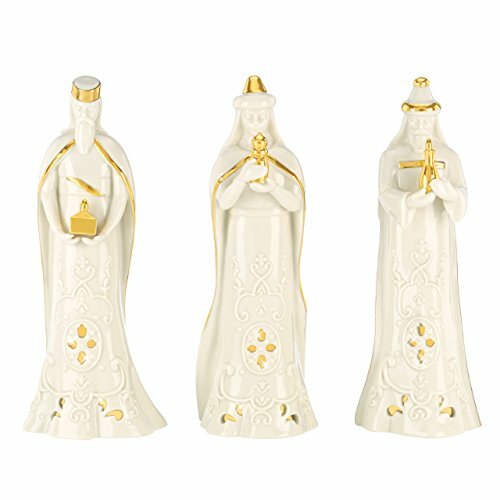 The Three Kings ivory porcelain figurine set glows with a warm light. This beautiful, hand-painted 3-piece set is lavishly accented with gold, and shines with an LED light. Batteries are included. View More In Tabletop Scenes.